The official announcement is out. New Eden is getting Thera and a two sets of shattered wormholes. Additions to existing classes of wormhole space, standard Shattered Wormholes are 75 new systems with new characteristics different from existing wormhole systems. No moons and only shattered planets. It will not be possible to populate these wormholes in the classic sense. No starbases, no permanent structures. Special landmark sites. New lore additions explaining why they exist, why they were previously inaccessible as well as storyline tie-ins. ICE! These shattered systems will have ice belts. An additional k-space static in addition to normal class based statics. This means that all levels of space (C1 through C6) will connect to k-space via statics inside Shattered wormholes. That's quite a collection of features, some of them very unique for wormhole space. Wormhole signatures and anomalies appropriate to Class 3 and Class 4 space with up to Class 6 gas spawns. As I indicated in my original Thera post as well as the follow-up, the Shattered Wormholes at first glance seemed to put a damper on the lore tie ins to Thera. Now, I am of the mind that this is not the case and my initial fears of the 100 new systems may have been unfounded. Thera is the only named wormhole system. It is quite possible that this is still the 31000005 referenced in the Tukoss message. This would leave open the possibility for future named systems. It will remain to be seen in the static data if this is the case. I hope it is. Shattered wormholes are very much tied into the lore story. The existence of Shattered Planets was researched by the Arek'Jaalan project, closely tied to Tukoss. The lore based sites inside these wormholes should provide additional clues as to the ongoing story. In reference to the recent Tukoss message, translations point to Tukoss believing he is being held in a Wolf-Rayet system. It is very possible that at the time of his transmission, he was inside one of the new small shattered wormholes. Which one remains to be seen, but possibly a unique lore site may be found there to provide a clue as to his whereabouts and his captors. I'm excited to see the Shattered Wormholes as part of existing wormhole classes. This makes this quite accessible to wormhole residents and daytrippers. In addition, the lore behind the systems does not contradict much of what has been developing and could still yet play out into the theories being developed. Given The Sanctuary presence in Thera, I suggest anyone interested in lore read Rhavas' post to understand why this is very very important. It has been confirmed that Thera is 31000005. This is very exciting and plays directly into the currently developing lore. Thera will have NPC stations, a "gigantic" number of wormhole connections, and lots of sites. In addition to these reveals, another Hilen message was posted today in the forums. The apparent translation of the message is along the lines that the previous messages cannot be trusted and Hilen is being held captive in a wormhole system. The message possibly makes reference to two more system identifiers that are way outside the known systems. Unfortunately, those numbers do not line up specifically with that 101 systems indicated by Fozzie. Either these things are unrelated or there was a missed opportunity to connect the two together. My initial out of character reaction is displeasure. There was a certain beauty to a small number of unique named wormhole systems being added. Even more so if it actually tied into the lore being presented. 101 systems is a significant number, nearly as many as all of Class 6 wormhole space. Given the large numbers of unoccupied existing wormhole systems, it leaves me thinking that these systems will be far from the busy hubs they appeared to be from the first announcement. Instead, it feels more like they will be a series of wastelands, unoccupied by many, adding little if any value to the existing universe. I am having a hard time seeing the goal of adding so many new wormhole-like systems. In addition, if "gigantic number" of wormhole connections is truly of a level not seen in existing space, Thera alone is going to make wormhole space a swiss cheese of connections. We saw this with the Kronos release when the frigate hole spawn rates were exceptionally high. It was not a pleasant state of affairs for wormholes where too much connectivity is just as bad, if not worse, as too little. I hope I can modify this update with a more positive result when the actual devblog lands, but with the information currently available, my excitement for this announcement has been drastically reduced. Sugar Kyle posted recently that she is taking on the challenge of wardec mechanics in EVE as part of the upcoming corporation and alliance retooling. Greedy Goblin posted today that EVE needs a corporation measuring stick, like a leaderboard to rid EVE of bad corporations. Purging bad corporations is a common claim from awoxers and wardec corporations of the need for the wardec mechanic. Leaderboards, however, make no sense in EVE, but perhaps with the corporation retooling Sugar is a part of it is time to rethink how corporations and shares work. To build a system where corporations can be compared and players can make the choice of which corporation to join for PvE. 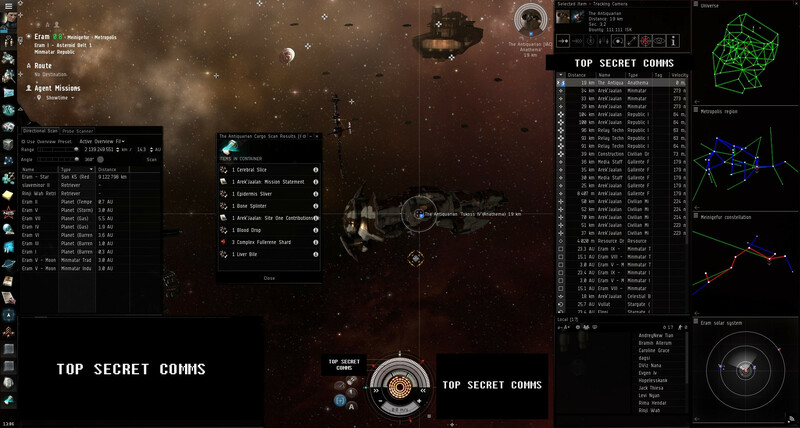 Killboards already exist in EVE to give a measure of a corporations PvP skills. There is no counterpart for PvE. Instead of leaderboards, though, EVE should allow corporations to mark themselves as business corporations as opposed to combat corporations. A business corporation would have to present balance sheets and other standard corporation reports that you would find in the real world. Make these reports public and searchable and part of the corporation search screens. Reports could include wallet balances, PvE operations reports, manufacturing reports and so on. At the same time you could allow for the shares to mean something, for people to invest in corporations and get returns on their investment. Now in EVE as it stands today, providing these reports would be a massively dangerous thing as it is free intel of a significant degree. In order to address this, business corporations would be immune from wardec. 100%. They would also be disallowed from aggressing any player in high security space for any reason. Any player joining a corporation that is not marked as a business would get a warning that this corporation lacks transparency and may not be a suitable place for every player, especially new players. A combat counterpart could also be introduced where a corporation is highlighted as a combat oriented group, their basic killboard numbers shown in the application screen leaving unmarked corporations as the only corporations left not providing any information and to a degree, discouraged by the in game tools from being shown to users unless they actively seek them out. With this simple change, you give corporations a way to opt-out of wardecs in return for providing detailed information about themselves that will help new and old players make a determination about their value in EVE relative to other corporations. In my last post, I proposed a kind of new wormhole space that would give wormhole residents something to fight over. It seems that CCP already had something up their sleeve that was announced yesterday as the big reveal on the o7 show, Thera. What we know about Thera so far is that it is a wormhole-like system, previously uncharted, that has NPC stations, is larger than any single system currently discovered, has static connections to k-space, wandering connections to w-space, and plays heavily into the events currently shaping New Eden. It is these events and Thera's place in them that I wanted to discuss. Recently there has been an uptick in developments surrounding sleepers and wormholes. First, about a month ago, we got word of the Sisters of EVE releasing new sleeper research findings. While nothing concrete came of this, it was quickly followed by a call from the navies for capsuleers to collect certain components related to sleepers. It didn't take long for a capsuleer by the name of Guillome Renard of the Sleeper Social Club to attempt to organize other capsuleers to beat the navies at their own game. While this effort was ultimately unsuccessful, his attempt caught the eye of many and prompted my own interest in what was happening. During this race, a capsuleer podcast known as the Hydrostatic podcast broadcast a segment claiming that the navies were lying to the capsuleers and also contained valuable information on a past research project known as Arek'Jaalan. The details of this project are available for all to read and were a critical component in the New Eden storyline before they were abruptly ended with the disappearance of Hilen Tukoss thus ending the project. In a stunning turn of events, a little more than a week after this broadcast and in the middle of the research race, Hilen Tukoss returned. The message was cryptic but it was quickly decoded by capsuleers indicating some issues with his transmission but the message he sent was clear. He needed some very rare items in order to continue his research. These items were the remnants of a Jove Diplomat that was killed in a teleporter accident and his bits scattered all over New Eden. The collection of these items at the time was done very similar to how the current research race is being handled and the "winners" then were granted Blueprint Originals for a cloaking device, a very valuable item indeed. The capsuleer reaction to this new message from Hilen was met with a variety of responses. But without further information, nothing could be done. Another week goes by and the research race concludes. A day after the announcement of the results, the SCC, the Secure Commerce Commission (not to be confused with the Sleeper Social Club), announced that the price paid for the sleeper components collected as part of the research race would be increased due to their hazardous nature. Within days, the Inner Circle of CONCORD, the friend of every capsuleer, was discovered to have held a secret summit on the activities of sleepers with the results of that summit being unknown. Interesting, but with no other information, the impact of this has yet to be determined. Things were quiet for a couple days and then something very interesting happened. Hilen Tukoss posted another, even more cryptic message. 31000005 = I was unable to identify this system. As you can see, one system is notably missing. 31000005. She noted that all known New Eden system identifiers started from 31000007. This was an uncharted system that Hilen was claiming had been colonized. Nothing specific came from this realization though there were some interesting developments surrounding the items Hilen had requested with photographic evidence being posted of The Antiquarian, a known collector of unique items, dropping the requested items into Site One. Here is where the known becomes the unknown. An out of game announcement was made about the discovery of Thera as I mentioned, it was said that this is one of a group of newly discovered systems. It is my belief that Thera is 31000005 and that the other systems are the remaining unknown New Eden system identifiers. This means that Thera and the new wormhole systems are playing a critical component in the actions of Hilen Tukoss and the ongoing narrative. This narrative is very likely closely tied to the eventual destination we have been informed of, the creation of capsuleer made stargates. And here is where I go completely into supposition. What if these stargates can only be originated from these seven new and uncharted systems? One of the massive challenges I see with the stargate idea is how do you stop existing large alliances from dominating stargate construction in their space? If stargates can be constructed anywhere, nothing can stop a well entrenched organization from doing whatever they want. How do you make it so that many have relatively equal access to the process? Such a new and fundamental addition to EVE should not be accessible only to a small portion of the population. This would induce rage unlike that seen since Incarna. But if these new systems are isolated from normal activities, difficult to control by a single entity, and truly the lawless, CONCORD-less space that they are rumored to be, then it would demand that capsuleers develop new organizational constructs in order to build stargates into these systems. New partnerships would need to be formed in order to get the materials collected. New agreements would have to be made for cooperation by entities wishing to participate. Efforts would likely also appear to thwart those attempting such construction necessitating protection of assets. And since there are no capital ships, no starbases allowed in Thera, and presumably the other systems as well, there is a built in limitation on the type of force that can be brought in and through those stargates. In many ways, it is genius if it is true. This may all be guesswork, or it may indeed be the beginnings of the new face of New Eden.